• Labels for clothes, cubby holes, etc. for summer camps, churches, and elementary schools. • Organizing and Labeling Inventory, Raw Materials, CD’s, DVD’s, Tapes, and much more. 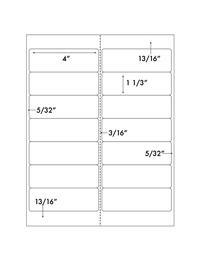 Size of Each Label: 4" X 1 1/3"
Distance From Left Edge: 5/32"
Distance From Top Edge: 13/16"